Despite Miss Spence's disapproval, the Astor marriage went ahead, only to be cut short when Col. Astor perished aboard the Titanic in April of 1912. 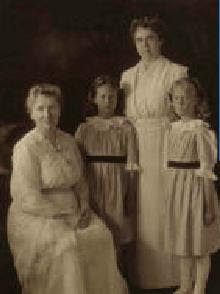 In August of 1912, three of the survivors, Madeline Astor, Mrs. George Widener, and Mrs. John B.Thayer, were in Bar Harbor as the guests of Mrs. A.J. Cassatt at "Four Acres", the Cassatt estate, which abuttied the property where Miss Baker and Miss Spence's new cottage was rising. The next summer, even as the Misses Baker and Spence were moving into "The Willows", Mrs. Astor was also moving, into a nearby cottage also designed by Andrews, Jaques & Rantoul, a few carefully raked gravel driveways up Eden Street from the famed educators. That house was 'La Selva', built in 1903 for Pennsylvania coal baron Andrew Davis. During Mrs. Astor's occupancy members of the press were frequently seen lurking at the gates in search of news about Mrs. Astor and her new baby, John Jacob Astor VI. 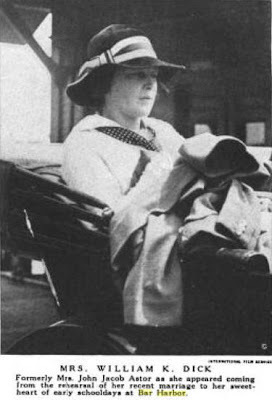 In 1916, Harper's Bazaar caught Mrs. Astor at Bar Harbor as she was about to be remarried. 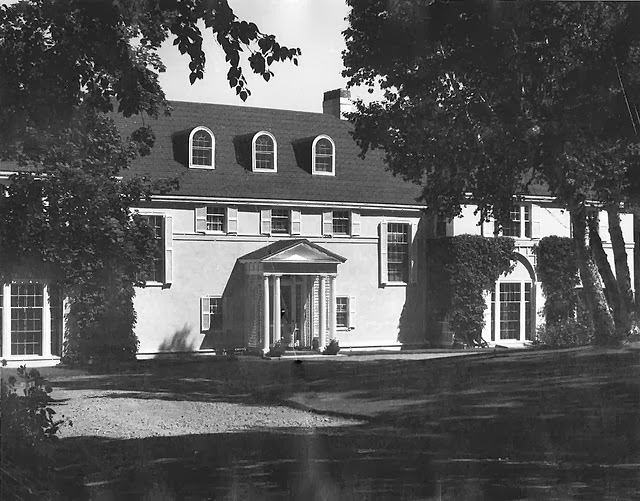 A few years later, Mrs. Astor would depart "La Selva" for a more secluded cottage on the George Vanderbilt estate, but "La Selva" would soon attract another colorful tenant, Mrs. Leonard Thomas, formerly Blanche Oelrichs of Newport, known professionally as the playwright, poet, and actress Michael Strange. Sometimes referred to as 'the most beautiful woman in America', Mrs. Thomas was already planning to leave her banker husband to obtain a Paris divorce, that she might run away with her lover, John Barrymore, one of the most famous actors of his day. 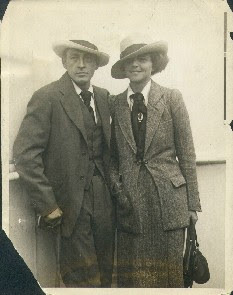 La Selva's next tenant was the beautiful Michael Strange (nee Blanche Oelrichs), seen here with her lover and later husband, John Barrymore. 'La Selva' is currently for sale, its condition more than a little reminiscent of 'Grey Gardens'. I have written its colorful history for 'House of the Month' in the current issue of Portland Monthly. The article may be read HERE. More pictures HERE. I'm afraid I've been a bit boring lately. 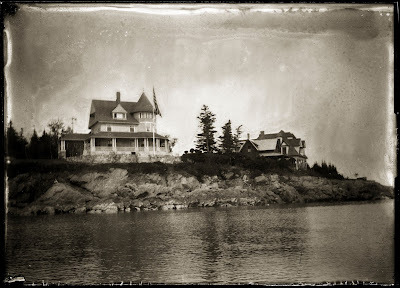 As the manuscript for the book starts to take shape, my focus has been narrowed to near obsession, on the architecture of the 27 different summer colonies that fan around this section of the coast, from Rockport to Winter Harbor, as I continue to visit archives and individuals in the search for interesting material. Once a Dilettante who knew a little bit about a great many trivial topics, I now know a great deal, much of it trivia, about one topic. 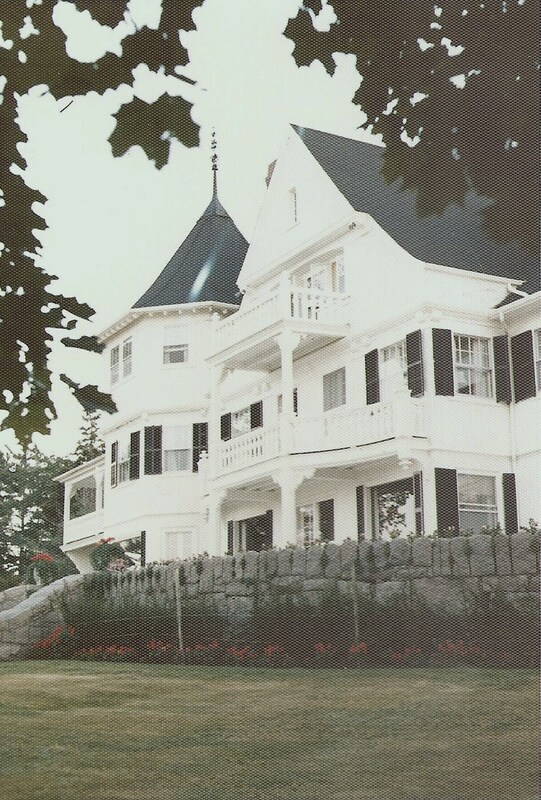 As the concept of summering, or as it was know then, rusticating, gained momentum in Maine in the 1880's, and as Bar Harbor became one of the most fashionable destinations in the country, a resort boom gripped the lonely shores across Frenchman's Bay from that gilded place. Large tracts of oceanfront land were gobbled up by real estate speculators hoping to repeat the momentum at Mt. Desert. Land companies were formed, lots were laid out, those dual necessities---steamship wharves and hotels---were built, illustrated brochures were printed, tennis grounds laid out, and the race was on to attract wealthy city dwellers to each Arcadia. Despite those common characteristics and amenities--including the imagination-defying views across to Mt. Desert perhaps without peer on the Atlantic coast---each of these colonies developed differently, each with its unique character. 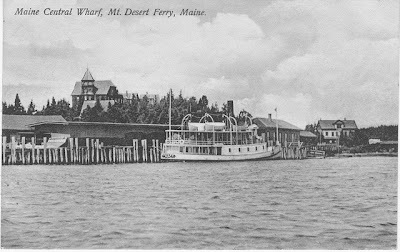 Today, those little colonies, far closer to Canada than to Kennebunkport, seem remote---as their inhabitants prefer it---but in the day, when steamship and train were the chief modes of travel, one could take a day boat to Bar Harbor--each community had service----go shopping, have lunch, or attend a concert or a ball, and be back home on the opposite shore in time for bed. Hancock Point was, I think, the earliest of these developments (the others were Sullivan Harbor, Sorrento, Winter Harbor, Grindstone Neck and Petit Manan Point), and geographically the first encountered as one sails 'down east' up the coast. It was conveniently adjacent to the train and steamship landing at Hancock Ferry, where later the crack Bar Harbor Express, originating at Grand Central in New York, had its terminus, trailing behind it the private railroad cars of the plutocrats who then would board a ferry for Bar Harbor. It was laid out in 1883 by Joseph Curtis, a pioneering landscape architect and conservationist who summered in Northeast Harbor. It was a far smaller development than the others---125 lots as opposed to the ambitious 2,000 proposed for Sullivan Harbor, for example. 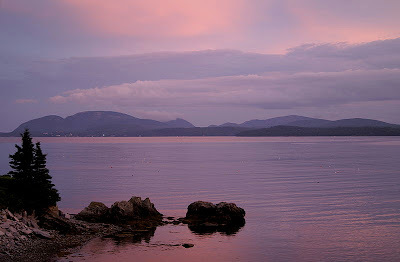 Many of Hancock Point's earliest summer residents were not from far cities, but were lumber merchants and bankers from Bangor. They were soon joined by college professors such as Charles Homer Haskins, the great Harvard medievalist, and by quietly well-to-do urbanites who preferred to avoid the flash of Mt. Desert (I've been to maybe a dozen cocktail parties on Hancock Point over the years, and unfailingly, at each one someone has pointed out how 'we' are not 'fancy' like 'them' over on Mt. Desert). At any rate, Hancock Point, after two World Wars, a great depression, and changes in travel, is a sleepy little place with big views and some very fine smaller summer cottage architecture along its gravel lanes. The earliest cottages were gingerbread designs, closely sited. By the end of the 19th century, comfortable but not vast shingle style cottages, on larger lots were the norm. Landscapes were kept simple, with respect for the natural landscape---very few of the elaborate gardens that characterized some of the summer estates of other resorts were laid out on Hancock Point. Once again, for those who may ever have wondered why Maine has 'Summer People' not 'Spring People', I present the answer. It's the middle of April, for crying out loud. Even with our lowered Spring expectations, this is cruel. In other news, the Maine lobster branding thing sometimes goes beyond the t-shirts and key chains. 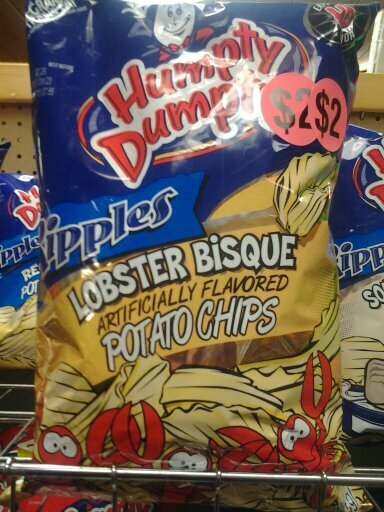 these were spotted in a local grocery store. Yuck. The 'Lobster Tracks' ice cream can be found in another aisle. 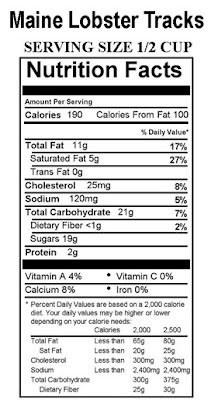 Since when is 1/2 cup a single serving of ice cream? Puhleeze. 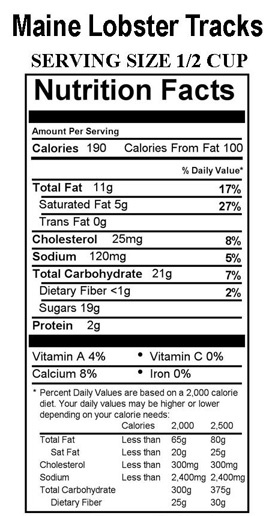 When was the last time you saw a 1/2 cup carton of ice cream? I passed through Manchester, New Hampshire the other day. 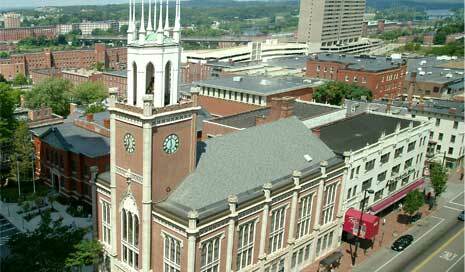 New Hampshire's largest city, it is a sprawling place, with a downtown badly impacted by Urban Renewal, and the decline of the textile industry that once made it one of the great manufacturing centers of New England. Despite this, many fine examples of 19th century architecture survive, in varying degrees of preservation, amidst the parking lots and malls. One that particularly catches my eye is the City Hall, designed in 1845 by the enterprising Edward Shaw of Boston, author of several of the most influential pattern books of his era. Originally stuccoed, and I'm told by a friend, scored and veined to resemble marble, the building was restored with its warm brick exposed, as it has been for many years. It once dominated Elm Street, the broad main street of the city, with its rows of low brick commercial structures. Today, its entrace faces one of Manchester's tallest buildings. Shaw's pattern books, like those of Asher Benjamin, helped spread the Greek Revival style through New England. 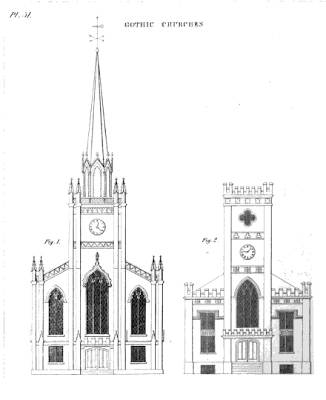 In the 1840's, he caught the Gothic bug, and along with New Yorkers Downing and Vaux, helped popularize the new style. Above, a plate from Shaw's 'Rural Architecture' (Boston, 1842). Variations of these designs, most often in wood, are seen across New England.